A decorated pilot and 20-year veteran of the National Guard will become the first woman to lead an Ohio Air National Guard wing. Col. Allison Miller takes command of the 179th Airlift Wing in Mansfield, Ohio, during an official change of command ceremony at 2 p.m. Sunday, Jan. 21 at the Mansfield Lahm Air National Guard Base in Mansfield, Ohio. Miller is currently the director of safety for the Air National Guard, and will be replacing Col. James Camp, who became the Ohio assistant adjutant general for Air on Dec. 29, 2017. “Col. Miller has had an exceptionally distinguished career over the past 20 years — starting out at the top as a distinguished graduate at the Academy of Military Science, graduating third in her undergraduate pilot training class, earning the highest academic honors from Air Command and Staff College, and supporting numerous deployments with more than 400 combat hours flying over Iraq and Afghanistan. Col. Miller is as ready as any Airman to fulfill the duties of wing command, and the men and women of the 179th Airlift Wing will be excited to welcome her to Ohio,” said Maj. Gen. Mark E. Bartman, Ohio adjutant general. In her new role, Miller will command the 1,100 Airmen of the 179th, which flies the C-130H Hercules to provide tactical airlift capabilities to both domestic and expeditionary missions. 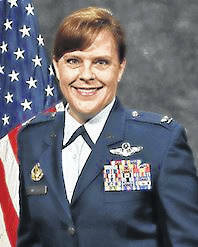 Miller began her military career in 1996 when she joined the Alabama Air National Guard. As the director of safety for the Air National Guard, she is responsible for managing all ground, flight, weapons, and space safety programs for 90 flying and mission support units encompassing more than 105,700 Air National Guard members nationwide. Brig. Gen. Steven S. Nordhaus, commander of the Air National Guard Readiness Center, also commented about Miller’s selection. “As the director of safety, Col. Miller has had a tremendously positive impact by reducing mishaps and fostering a culture of safety across the Air National Guard. Col. Miller will lead with distinction and continue the great tradition of the 179 AW,” Nordhaus said. Miller has served in Operations Noble Eagle, Enduring Freedom, Iraqi Freedom, New Dawn and Inherent Resolve. She earned her bachelor’s degree in aviation management and flight in 1993 from Auburn University in Alabama and a master’s of military operational art and science in 2013. The Ohio National Guard has more than 16,000 personnel and is the nation’s fourth-largest National Guard. The Ohio National Guard responds with ready units and personnel when called for federal, state and community missions, and is an operational reserve of the U.S. Army and U.S. Air Force.